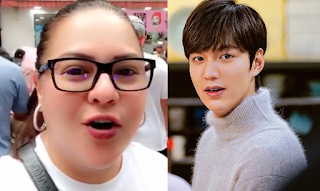 Karla Estrada, who was spending quality time with her children, went into fan mode during their short vacation in South Korea. The 'Magandang Buhay' host came across to Korean actor Lee Min Ho's handprint at the Star Avenue in Lotte DFS Myeongdong. In her latest instagram post, she shared a photo of her hand placed on the handprint of the Korean actor. She captioned it: "Holding Hands with Lee Min Ho!😂😂😂 #asa😭"
The post has gained 14k likes, as of writing.